Our family is already looking forward to the upcoming 4th of July holiday to celebrate America’s declaration of Independence. Have you download your copy of my 4th of July Printable Pack yet? Well, today I’m bringing you more printables to celebrate America’s independence: my 4th of July Do-a-Dot Printables Pack! Note: For more 4th of July activities and printables, see my 4th of July activities page. And for more do-a-dot printables, see my do-a-dot printables page. Plus, see my post sharing 15+ ideas for using do-a-dot printables for learning. 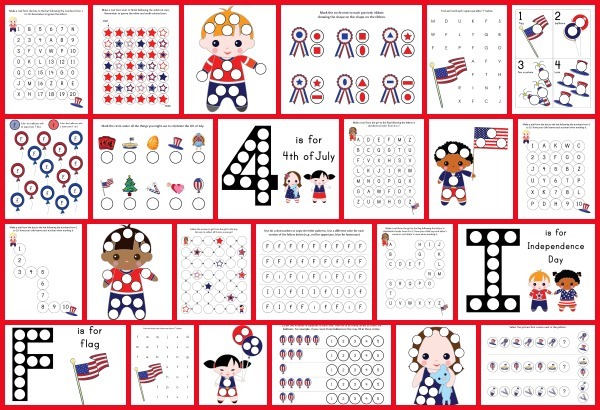 My 4th of July Do-a-Dot Printables pack contains 24 pages of patriotic do-a-dot worksheets. As kids complete these worksheets, they will work on one-to-one correspondence, shapes, colors, patterning, letters, numbers, and counting. 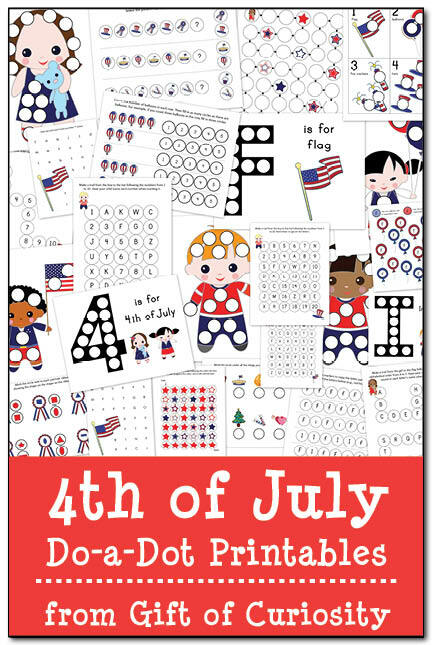 The activities in my 4th of July Do-a-Dot Printables pack are designed to be completed using do-a-dot markers . Do-a-dot markers are particularly useful for young children who have not yet developed the fine motor skills to use a pencil or crayon. Because of their large diameter, they are easy for small hands to grasp and they don’t require great fine motor skills to use. Using do-a-dot markers, even little ones can color in pictures, hunt for items in a worksheet, and express themselves creatively at a younger age than is possible for them if they are required to hold a pencil or crayon. Of course, many older children who are capable of using a pencil or crayon – including my own – enjoy using do-a-dot markers as well. There’s a uniqueness factor to do-a-dot markers that just makes them more fun than using pencils or crayons. Although I am a fan of do-a-dot markers , I’ve also written in this post about many other ways to use do-a-dot printables to support children’s learning across a wide range of ages. So even if you don’t own do-a-dot markers, you’ll find that these printables can still be of value to you and your children. The activities in this pack cover a range of skills. This means that the worksheets in this pack are likely to appeal to toddlers, preschoolers, and early elementary students. Plus, you can use these even for older kids if you borrow some of the ideas in my 15+ ideas for using do-a-dot printables for learning post. 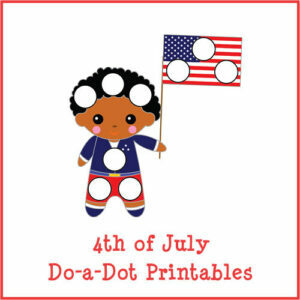 Want a copy of my 4th of July Do-a-Dot Printables? My son LOVE, LOVE, LOVES your do-a-dot pages! Thanks so much for your generosity and for sharing this at the After School Linky Party! Aww, thanks! Keep an eye out because I’ll be sharing several more do-a-dot packs in the coming weeks!